A laser-powered wafer-thin spacecraft capable of reaching Alpha Centauri in 20 years may sound like the stuff of science fiction, but it's not. And while such a launch isn't imminent, the possibility of one in the future does exist, according to UC Santa Barbara physics professor Philip Lubin. To further explore that possibility, Lubin and his team in UCSB's Experimental Cosmology Group will study photo-driven propulsion—the use of lasers as a means to power a spacecraft. The group has been awarded one of 15 proof-of-concept grants from NASA Innovative Advanced Concepts. The NASA program aims to turn what sounds like science fiction into science fact through the development of pioneering technologies. "One of humanity's grand challenges is to explore other solar systems by sending probes—and eventually life," said Lubin. "We propose a system that will allow us to take the first step toward interstellar exploration using directed energy propulsion combined with miniature probes. Along with recent work on wafer-scale photonics, we can now envision combining these technologies to enable a realistic approach to sending probes far outside our solar system." The UCSB group's ultimate goal is to send small probes to supplement the current long-range remote sensing done by orbital and ground-based telescopes. The funding will enable Lubin's team to create a more complete roadmap for building a fully functional wafer-scale spacecraft complete with power, laser communications and controllable photon thrusters. 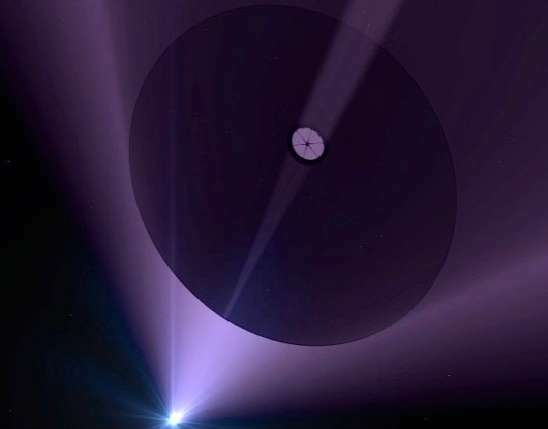 The project, Directed Energy Propulsion for Interstellar exploratioN (DEEP-IN), will also chart laser driver elements that require technology development. The key to a functioning system lies in the ability to build both the photon driver and the ultra-low-mass probes. While capable of propelling any spacecraft mass, lower-mass probes go the fastest and are most suitable for interstellar missions. The DEEP-IN design keeps the main propulsion driver back in Earth's orbit (or nearby) yet still capable of propelling highly integrated spacecraft to speeds vastly higher than anything scientists can currently achieve. The laser photon driver would use photon pressure in the form of streamed energy to power the spacecraft as it travels away from Earth. With no intrinsic speed limit, this technology allows for the relativistic speeds necessary for interstellar flight. The same systems can be used for many other purposes, according to Lubin, including travel inside our solar system—such as rapid transit to Mars with much larger probes—and planetary defense. As another example of this technology, at last spring's Planetary Defense Conference in Italy, UCSB participated in an exercise to counter a simulated asteroid impact threat to Earth. The group's solution: deflecting the threat's path using DE-STAR technology, originally conceived by Lubin and Gary Hughes, an assistant professor at California Polytechnic State University, San Luis Obispo. DE-STAR—or Directed Energy Solar Targeting of Asteroids and exploRation—is the core directed energy technology proposed both for relativistic spacecraft and as a means of mitigating potential threats to the Earth, such as those posed by asteroids and comets. This technology is completely modular and scalable over an enormous range so it could be used today for small, dedicated planetary defense missions and in the future scaled up to power photon-driven spacecraft of varying sizes and mission capabilities such as the DEEP-IN program. "While not suitable for every spacecraft design, this approach opens up radically new possibilities," Lubin said. "The project is a step toward the first interstellar mission, but more importantly we are studying and designing the relevant technological base. This will give us the ability to build a single photon driver capable of sending out literally millions of low-mass probes. "We've had to radically rethink our strategy in order not to give up our dreams of reaching the stars," Lubin added. "DEEP-IN posits a technological path forward that, while not simple, is within our technological reach to begin." Not said is just where the propulsion unit is, on earth or aboard the starship. If aboard the starship then let us do it. If it is on earth, rotsa ruck chuck. Targeting difficulties and beam diversion/focus will ruin this plan before birth.